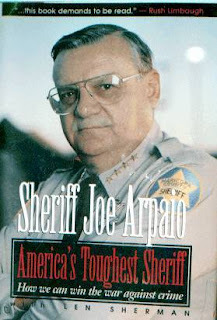 He took away cable TV until he found out there was a f ederal court order that required cable TV for jails. So he hooked up the cable TV again only let in the Disney channel and the weather channel. 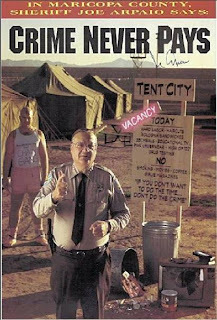 Joe Arpaio, the tough-guy sheriff wh o created the tent city and long ago started making his prisoners wear pink, and eat bologna sandwiches, is not one bit sympathetic He said Wednesday that he told all of the inmates: "It's 120 degrees in Iraq and our soldiers are living in tents too, and they have to wear full battle gear, but they didn't commit any crimes, so shut your damn mouths!" Labels: "joe arpaio", "maricopa arizona", "maricopa county jail"